CHICAGO, July 19, 2017 – Leading Real Estate Companies of the World® and Luxury Portfolio International® are proud to announce the winners of the 2017 HGTV Ultimate House Hunt, a month-long online promotion held on HGTV.com each year. Leading Real Estate Companies of the World® and Luxury Portfolio International® are HGTV’s exclusive real estate partners for the contest, which ended on July 18. The contest highlighted exceptional homes from across the globe in eight categories, represented by members of Leading Real Estate Companies of the World® and Luxury Portfolio International®. Consumers voted for their favorites in each category, including the highly coveted overall fan favorite award, which was awarded to Turks & Caicos Property, which also won the Waterfront Homes category for its stunning beachfront estate. Winners in the other categories are Pinnacle Estate Properties, Inc. for Curb Appeal, Willis Allen Real Estate for Great Estates, Wetag Consulting for International Homes, Weichert REALTORS Coastal Properties for Kitchen + Dining, Alain Pinel Realtors for Living Large in Small Spaces, Sibarth Real Estate for Modern Masterpieces, and Hawaii Life Real Estate Brokers for Outdoor Retreats. In addition to bragging rights, the winning homes receive additional editorial exposure on HGTV.com. To view the Ultimate House Hunt winners, visit hgtv.com/househunt. Luxury Portfolio International® (www.LuxuryPortfolio.com) is the luxury face of Leading Real Estate Companies of the World®, the largest global network of premier locally branded companies dominated by many of the world’s most powerful independent luxury brokerages. Luxury Portfolio International® attracts a global audience of visitors from over 200 countries/territories every month and marketed over 50,000 luxury homes to over three million high-net-worth visitors last year. Download a PDF of this article here, or, if you are an Inman News subscriber, view online here. • Leading Real Estate Companies of the World (LeadingRE) is a community for independent brokerages that seek national and international referrals, an annual conference and a bigger network. • The organization has an almost 50 percent referral conversion rate compared to the industry standard of 25 percent. Agents looking to hitch their wagon to the right brokerage might ask about culture, mentorship, educational resources and tech tools — all elements that many independent brokerages have found ways to offer at the same (or even greater) level than their franchise counterparts. But what about the networking, the cross-country connections and — most importantly — the referrals? Franchises with branches across the nation are naturally equipped to refer leads to one another, a particular advantage when it comes to clients who are relocating. That’s where Leading Real Estate Companies of the World (LeadingRE) comes in, an organization that describes itself as a selective global community of the highest quality independent real estate companies with over 572 network members worldwide and 130,000 sales associates across 65 countries. Since it formed in 1997 as the result 50 large brokerages departing from a relocation organization and a merger with the Genesis network (then a referral network made up of indie brokerages), the organization has been filling in that benefit which franchises enjoy as a built-in perk: power in numbers. There’s a catch, however, and it’s one that strengthens LeadingRE: Not just any indie brokerage can join. Members must rank among the top five independents in their market (and be in the top 10 overall) in either units or volume, and there is often more than one member company in the most populated markets. How does this intricate web of companies operate, what’s next for this immense organization and who controls it? Here’s a look inside. The founding 50 brokerages of LeadingRE aimed to control their own destiny and create a network made up of “only the best” locally and regionally branded firms focused on raising the bar in real estate. The Chicago-based organization is held by 33 shareholder companies today, including Allen Tate, Long & Foster, Howard Hanna, Alain Pinel, Edina Realty, John L. Scott, Michael Saunders, Shorewest and Real Estate One. Of the 572 network members worldwide, 466 are in the U.S. and Canada, the total generating over 1.1 million transactions annually, with $368 billion in home sales. LeadingRE connects members with opportunities and people around the globe, supporting them with an international referral network, professional development programs, networking events and connections to people and opportunities worldwide. The organization’s referral program has an enviable 50 percent conversion rate, compared to the industry standard of closer to 25 percent. LeadingRE president Pam O’Connor says 14 out of the top 25 Real Trends’ brokerages are LeadingRE members. Members range from companies as big as Howard Hanna, Windermere Real Estate and Edina Realty and as small as a one-office luxury brokerages such as Hilton & Highland in Beverly Hills, California. Networking opportunities and collaboration happen in the flesh at the organization’s annual U.S. conference, which normally attracts around 2,000 attendees. There are also CEO forums, regional events and a big international get together for those outside the U.S. Membership costs come in tiers — expenses range from $3,000 to $4,000 a year for a small market up to the $70,000 to $80,000 range for firms with a number of markets and ZIP codes, as in the case of Long & Foster and Howard Hanna, for instance. LeadingRE chair Joe Horning, president of Shorewest Realtors, a third generation independent brokerage based in Milwaukee, Wisconsin, likes to describe LeadingRE as the “non-franchise for independents” and says it’s interesting to see former franchise companies he has acquired contrast their experience with LeadingRE at Shorewest. Horning gets asked all the time in his marketplace to join a franchise, but his thinking is: “You are not growing or expanding; why would I want to be telling your story?” Because they have skin in the game, LeadingRE members are very active participants, willing to share knowledge even if they are direct competitors, said Horning. What comes with a LeadingRE membership? Members can attend conferences where brokers passionate about tech tools meet, give guidance and share ideas about marketing and technology. LeadingRE’s Marketing Technology Advisory Council (MTAC) reviews all programs, provides input for conference content and the vendor partner program, and raises topics for staff to address. The results and findings are shared with the membership at large. They look over vendors to help guide members, attempt to identify the best ones and promote the ones that seem to be the cream of the crop, said Horning. Many members access the preferred providers promoted at conferences and through the “Solutions Group” vendor partner program, often with preferred pricing or other benefits not available if they ordered on their own. Former LeadingRE member Liz Nunan has just joined the organization as executive vice president of member services, to be located in Chicago, where close to 100 staff members are based. She was vice president of global business development at New York firm Houlihan Lawrence, which was acquired by HomeServices of America in January this year. As Houlihan Lawrence is retaining its brand name, it will be able to maintain its membership with LeadingRE as other HomeServices companies have done. Nunan is a big fan of the LeadingRE learning management platform, Institute, which gives members access to a number of educational and agent development opportunities. All members get access to the online courses, which include continuing education, a library and webinars. About a third of the 300-plus proprietary LeadingRE-produced courses are free, and the others have iTunes-like pricing of $7.99 each. For an extra fee, brokerages can opt for the annual enterprise subscription, which gives their agents access to all at no cost. In many cases, franchises — where relocation referrals flow more abundantly — are better equipped for relocation work than independents. LeadingRE sister company RELO Direct aims to level the playing field as a tool for independent brokerage members, said Nunan, who has a background in corporate relocation. “At Houlihan Lawrence, if I had a lead with a corporate client that wanted home buyouts, for instance, I could partner with RELO Direct which would help win the business,” said Nunan. The new EVP sees her role to push more referrals through the network, which has always been the driving force of the network’s foundations. Next month, LeadingRE will run a referral and relocation forum in Chicago, where all the relocation directors and coordinators will come together to generate more referral business. With LeadingRE’s U.S. market fairly saturated, building up the international members is a key focus for O’Connor, who is working with staff based in Europe and Asia to identify firms for potential membership and to bolster international referrals. Some opportunities will still pop up in the U.S. for new members. LeadingRE has a year-long contract with each of its members. “Anybody can leave with 90 days’ notice,” said O’Connor. Referrals are the bread and butter when it comes to member brokerage ROI, with 35,000 referrals generated a year through the network. The organization has done sessions on succession planning because it is such a big issue with members, she added. Luxury Portfolio International, LeadingRE’s luxury division, is another major cog in the machine. Set up in 2005 at the urging of its members, it’s headed by Paul Boomsma, Leading RE’s COO who previously managed marketing for a Sotheby’s affiliate. Half of LeadingRE’s members are also Luxury Portfolio members. Brokerages in this niche should be selling properties of $1 million and over, he said. Luxury members, who already have a presence in the luxury real estate space, gain access to global markets through Luxury Portfolio’s website, advertising programs and global audience. By pooling resources, Luxury Portfolio can secure good placements in print and online advertising. Boomsma knows that no one in the luxury field has to buy a home, so the promotion has to tell a story and have impact. Through surveys and white papers,the luxury division also offers education on what’s going on with today’s affluent buyers and sellers; their wants, needs and concerns, and networking and connections. Boomsma and the management team recently ran a series of seven broker forums around the country. “The idea was to bring brokers in to discuss their top concerns and how are they dealing with them, how can we assist. Everything from being recruited against, different technologies, the challenges of low inventory, where they should be focusing their dollars,” Boomsma said. Boomsma welcomed the arrival of chief economist Marci Rossell to LeadingRE earlier this year. Rossell is the former chief economist for CNBC and is bringing an understanding of monetary policy and political climates to the organization and its members, and how they affect real estate markets. With members all over Europe and in Australia, South Africa and New Zealand, Ron Stader, owner of CIR Realty, based in Calgary, Canada, is chair of LeadingRE’s global advisory board and is also on the main board of LeadingRE. According to Stader, CIR is the largest brokerage among independents and franchises in Alberta with a sales volume of CA$2.54 billion in 2016. It became a LeadingRE member nine years ago and is also a Luxury Portfolio member. “Instead of 720 Realtors today, I would say if not for nine years with LeadingRE, we would be 520 realtors and that’s not an exaggeration,” said Stader. 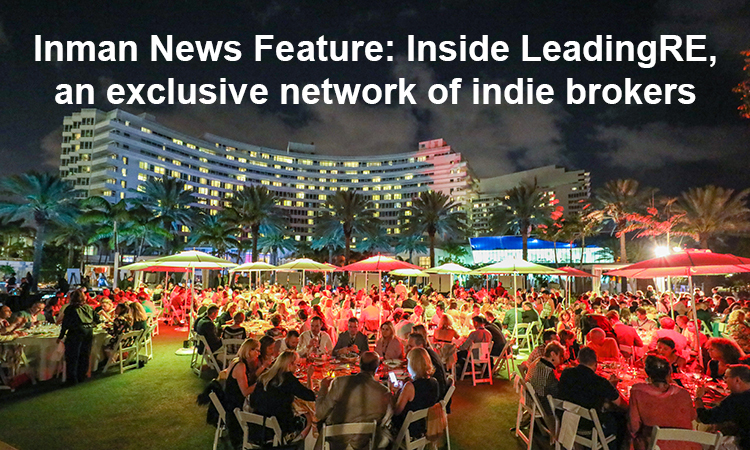 Stader also believes the maverick spirit of independents makes their conferences — where you get “unique perspectives on the industry” — more interesting than other industry conferences. CHICAGO – (7/17/17) – For the first half of 2017, Leading Real Estate Companies of the World® (LeadingRE) continued to see expansion with the addition of 26 market-leading real estate firms in nine countries, increasing the network’s coverage to more than 565 firms across six continents with a total of over 130,000 associates. Top-performing firms were added in the Republic of Korea, Russia, Italy, Portugal, Canada, Central America and the United States. These firms were selected for membership in LeadingRE’s invitation-only real estate community based on their market leadership and commitment to quality. As members of Leading Real Estate Companies of the World®, they have access to an international referral network that generates over 30,000 referrals annually, award-winning professional development programs, robust marketing programs, unique events and exposure to opportunities worldwide. Companies joining from the EMEA region of Europe/Middle East/Africa include: ADVECS Real Estate Corporation, St. Petersburg, Russia; Formicola Servizi Immobiliari, Napoli, Italy; Inmobiliaria ASTEN Tenerife, SL, Tenerife, Spain; Mallorca Gold, Palma de Mallorca, Spain; One Select Properties, Almancil, Portugal; and VOC International, Amsterdam, Netherlands. In the Asia Pacific region, LeadingRE welcomed Korea Global Realty. Ltd, Seoul, Republic of Korea. Additions in the Latin and Central American region include Keys Bahamas realty Ltd, Freeport, Grand Bahamas and Costa Luxury Properties, Cancun, Mexico. New U.S. firms include: Amherst Madison Legacy Real Estate, Boise, Idaho; Bluebird Real Estate, Crested Butte, Colo.; CBSHome, Omaha, Neb. ; Home Advantage Realty, Columbia S.C.; Jackson Hole Real Estate Associates, Jackson, Wyo. ; Kinlin Grover Real Estate, Osterville, Mass. ; Ming Tree Realtors, Eureka, Calif.; Pacific Union, San Francisco, Calif.; Page Taft Real Estate, Guilford, Conn.; Premier Homes & Properties, Kingsport, Tenn.; Ramus Realty, Pottsville, Penn. ; Randall Realtors, Charlestown, R.I.; Southern Properties Agency, Fort Payne, Ala.; Strand Hill Properties, Manhattan Beach, Calif.; Weichert Realtors – First Tier, Columbia, Mo. ; and Woods Bro Realty Inc./HOME Real Estate, Lincoln, Neb. Joining the network from Canada is TrilliumWest Real Estate Brokerage in Guelph, Ontario. CHICAGO – (7/14/17) – Leading Real Estate Companies of the World® (LeadingRE) is proud to acknowledge its high-achieving U.S. member agents named to the “The Thousand,” an annual ranking from REAL Trends Inc., issued in conjunction with The Wall Street Journal, that lists America’s top 1,000 real estate sales professionals and teams. Out of the 250 individuals recognized for their prodigious sales volume, 47 (19%) are LeadingRE members and of the 250 teams ranked, 34 of them (14%) are also members. LeadingRE members also ranked highly for transaction sides. A total of 35 teams and 19 individuals were recognized, representing 15,126 transaction sides. The total sales volume for LeadingRE member agents placing in this elite group is over $13 billion. Rankings for the REAL Trends study are compiled based on surveys and represent virtually every nationally branded network, state and local associations of Realtors®, multiple listing services, and the largest brokerage firms in the United States. All entries require a third party verification in order to be considered. Earlier this year, REAL Trends released the REAL Trends 500, a ranking of the top 500 residential firms in the U.S. Of that list, LeadingRE produced 25.7% of the total sales units, outselling any individual franchise network, and LeadingRE members represented 14 of the top 25 firms.